Cincinnati Bearcats defeat Missouri Tigers 78-63, will face UConn Saturday in D.C.
Cashmere Wright of Cincinnati runs the offense for the Bearcats, who will face UConn Saturday in the NCAA tournament. Photo by Mike Frandsen. The sixth-seeded Cincinnati Bearcats used a stifling defense and a strong front line to easily handle the 11th-seeded Missouri Tigers 78-63 in a West regional game Thursday night at Verizon Center in Washington, D.C.
Yancy Gates led the Bearcats with 18 points and 11 rebounds and Dion Dixon scored 16 for Cincinnati. 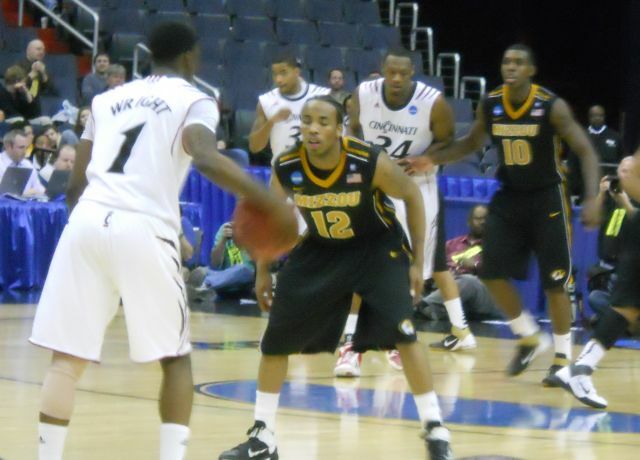 Point guard Cashmere Wright added 11 points and seven assists for the Bearcats. Ricardo Ratliffe led Missouri with 13. After the Tigers jumped out to a 9-2 lead, Cincinnati (26-8) took its first lead at 20-19 midway through the first half and never looked back. Cincinnati led 39-28 at halftime. This blog is brought to you by http://www.mikeneedsakidney.com/. Please consider donating. Thanks. This entry was posted on March 18, 2011 at 10:18 am and is filed under College Basketball, Examiner.com. You can follow any responses to this entry through the RSS 2.0 feed. Responses are currently closed, but you can trackback from your own site.